Previously, on MinerBumping... They said the siege had to end soon. It couldn't last forever, could it? But Mission Ready Mining corporation found itself locked in a seemingly interminable battle with the Agents of the New Order. The Gelhan system, once home to a frenzy of mining activity, was shut down by Agents like expert bumper Georgia B Dixie. But MRM had over 2,400 members at its command, and eventually, they had to do something. The giant corporation began sending fleets to Gelhan. Numerous pilots swarmed the asteroid belts. They were assigned the task of protecting a handful of miners who were still willing to risk destruction. It was not enough. Our heroes were still able to slip into the belts and gank their targets, right before the watchful eyes of the miners' would-be defenders. MRM remained defiant in local. However, their morale was severely undermined by the ganks. They'd been assured that with enough defense ships, they'd be untouchable. Now they knew it wasn't true. The defenders, too, lost confidence in themselves. They were putting in a lot of time--time that could be used for grinding isk--and it wasn't paying off. The miners they were "protecting" still got ganked. What was the point? Finally, the MRM defense fleet had no choice but to advise the miners not to mine while Agents were in the system. They couldn't guarantee their safety. Unfortunately, our Agents had a habit of idling in the system, making it difficult to know when it was safe to undock. But surely--surely!--the siege of Gelhan would end eventually. The next day, Orca pilot Le Anne tried to return to mining, only to be bumped away by Agent Georgia. The MRM defense fleet, whose ranks had been noticeably thinned due to the previous day's failures, was useless. Le Anne would need to take matters into her own hands. Le Anne had a nasty surprise in store for Georgia. Le Anne wasn't just another carebear-staring yellowboxer. 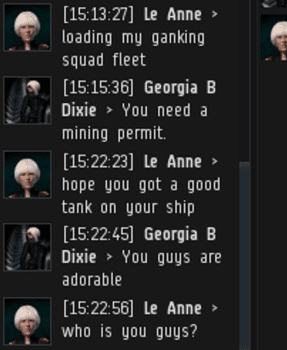 No, she had a gank fleet ready to pounce on Georgia's bumping Machariel. Eventually, Le Anne revealed that she didn't have any gankers at her disposal. 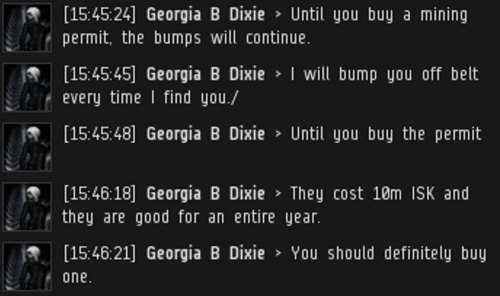 Unable to escape the bumps, she decided her only option was to file a petition and hope that CCP would ban Georgia. Despite the petition threat, Georgia wouldn't stop bumping Le Anne. Not until she complied with the Code. The MRM defense fleet looked on, helpless. 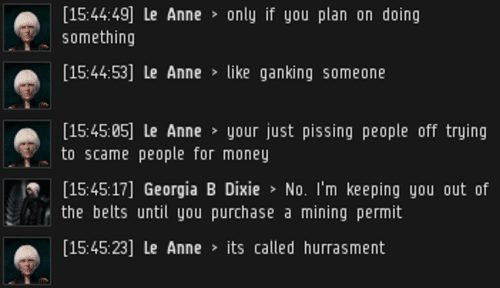 Even if CCP wouldn't ban Georgia, maybe Le Anne could persuade Georgia that she was breaking the terms of the EULA? Alas, the strategy failed. Georgia wouldn't stop bumping, and the New Order wouldn't lift the siege of Gelhan. The miners were aghast. This madness had already gone on for far longer than anyone could've imagined--yet it would continue still. Surely a corporation with 2,400 members could find a way to put a stop to this? 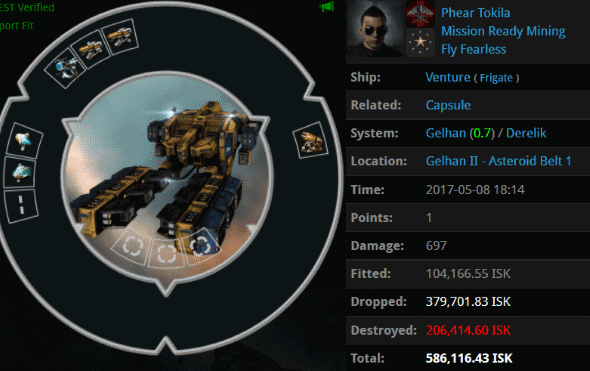 Another poor carebear article, remember all who hide in High Sec are carebears they cannot escape the code of pvp no matter what they claim to be, no matter who they kill. They are all the same as miners. Do not pity them, they live in the fantasy that a failure created for them. Interesting. You should write an article about it on the hisec militia blog that no one reads. Anon 639 has never left Arnon. Shall we pity you? Anon 639 do tell us more about your elite PVP and how much you do not care about what happens in high sec. I'll just wait here. His actions speak louder than his words. He does care about High Sec or he wouldn't be on this site. He's like those anti-gankers who flee to Null every time their feelings get hurt or they have one incident of failure. Who are they called again, oh yeah, Silent Infinity. No one can serve two masters. Either you love one and despise the other. As for us, we know High Sec is worth fighting for, and will continue to make it a better place till end game! The code says he is a carebear and a failure therefor he is a carebear and failure. 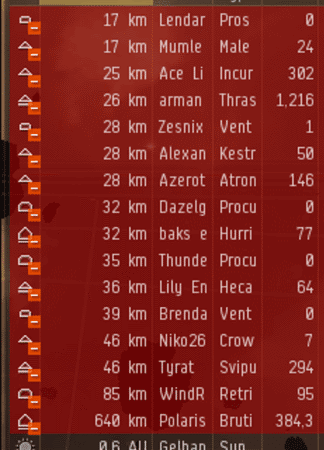 You cannot impede the code, you cannot defeat the code, just stay in high sec where carebears belong. Just prove that you love me that you will love me forever. Anon 748 Not in Arnon try harder code miner. Anon 639 yes a generalized progression of leaving high sec is pretty much as one would imagine if you were not following a code written by someone who got killed in low sec and decided its far too dangerous to stay so he returned to high sec and wrote his manifesto to pull in the gullible who also fear low sec. Yes I remember it well as I ventured into low sec feeling a little brave yet fearful as I began to travel through space that had no controls to protect me in any way. I hunted NPC's to start which had some better difficulties but were still not a challenge I then started mining ops to get some isk together while I searched for a place to set up camps and traps, as well as chat in the local chats to meet people and get advice. "Go back to High Sec" was comman to hear, probably one James heard many times and then did as was instructed. Yes flying into a solo gate camper was my first PVP in low sec as this pilot scrammed me and webbed me and proceeded to blast me. I went into triage mode and assessed my damage, then I began my repairs and turned attention to the lone ganker, I then began to return fire in a focused broadside and with little time dispatched my foe before he could break contact and warp away. I won the fight but learned that I needed more work to my ship before I could get into more encounters. Lessons learned from first encounter: Fit a web and scrambler, my opponent could have gotten away if his fit was better. Do not allow my enemies to escape, kill them and pod them. Find friends and travel in groups, 2 is good 3 better more "NICE", if we travel in groups and warp in a bounding way then we allow our foes to get overconfident, when the others warp in upon an ambush our foes will have to switch fire, break contact, or call in QRF. Always expect there to be a fight at every gate, station, belt, etc. High sec is easy to deal with, you don't have to keep your head on a swivel, you just need to be aware. and if you get ganked understand that your foe will be neutralized. Follow the code of eve and all will be good. There you go anon 831, you have my permission to stop crying now. T-thank you master! *goes to sleep on floor*. Great beginner lesson for these code miners, I hope there are some in here that would like further lessons so perhaps they can leave high sec and become elite instead of remaining carebears. Anon443 is just another butthurt hisec miner trying to sound like he's not, without a shred of proof. He must think we are all as simple as he is to be posting pvp claims without proof. If he did what he says he did, he would have proof, and not be afraid to post it. Nice try salty miner. You do however add evidence to the claims that carebears are incapable of telling the truth. Look a code miner trying to act tough, still in high sec carebear land though. "Unfortunately, our Agents had a habit of idling in the system," How is this different from AFK? Because idling is not the same as being AFK. Staying in local chat tends to spook them and they scurry away or defile local. In these circumstances being on point is necessary for the wider audience's amusement and delectation. It seems pretty similar when your minions are not typing anything into local and sitting perfectly still while I orbit their ships, it's almost like they are not even there. 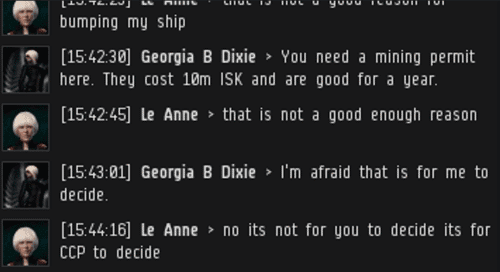 You are allowed to go AFK when docked miner. What's prohibited is AFK -mining-. It's in The Code. You didn't study it yet? That wouldn't work pilots can see who is docked up in the station guest list, the code drones would need to be in space to get the full effect. Which is where I find them quite often sitting perfectly still. The carebear code keeps dying because they cannot follow the code of Eve and progress into low sec. They must remain in high sec and accept their shame with their failed leader who hides in high sec because he failed everywhere else. It does, since a real human should say things that make sense. So the defense fleet of the orc just watches it get bumped? I thought suicide ganking was easy why couldn't get nab Agent Georgia? PATHETIC!! Where was the bastards?!? Where was the High Sec Militia?!?! They were too busy trying to come up with content for their hisec militia blog that no one reads. They never think of using ganks against a ganker/bumper, they aren't smart enough for that. Instead, the call will go out for a fleet, and every member will load-up their "best PvP ship" (which will undoubtedly be a mess of fail-fit abominations) while thinking how badass they are right now. Then they'll form a fleet that can't do jack to a bumper without a wardec, and sit there giving them the carebear stare while talking trash in local. The former potential answer is correct. There is no hsm friend, they're too scared to start a real corp with that name. How can they be a militia if they are too scared to form up and legally wardec ganker corps? Same goes for the rest of the "antigankers". If they don't have the balls to form player corporations and stand behind it and defend it then they don't belong in, or deserve to play Eve. Kill them all (in game) until they become real Eve players by figbting back, or ragequit and return to whatever theme park they came from. They can't stop us without destroying Eve so we have already won, and now it's time to enjoy the fruits of our labor. I will be enjoying it by killing every highsec carebear I can, repeatedly, until they leave. "Leave where?" you ask, "hisec or Eve"? Yes. Either one means Eve wins. Same goes for all who live in High sec, if you cant stomach PvP then stay in carebear land and leave the elite gameplay to real players. Almost as if AG are just windowlickers, eh? Are you talking about going AFK? I just want all of these miners to calm down and read the Code. Perhaps try a cup of chamomile tea? Funny how failures stay in high sec and act like elites. What's hilarious is, been mining 10 years with my fleet of hulks. Not once, ever. could they even gank any of my ships. CODE. are a bunch of pussies. i've been around before they were even born, and i'll still be around long after they are all banned. yes they will all get banned eventually because they are in reality breaking several terms of services. i really hope these stupid losers can read because they seem to think terms of services doesn not apply to them. 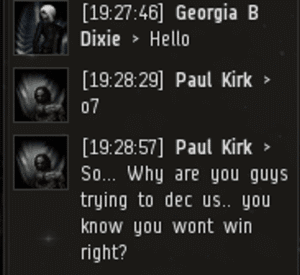 funny how i've single handedly had over two dozen of them mysteriously "banned" from eve. so my efforts are working better than their ganking does. I've spent the last 10 years mining in a PVP game. I sure showed them! I cant gank the miner so I'm just gonna claim victory anyway. Too bad, cry some more about it.